Get a professional plumbing repipe by Clovis Plumbing Services! Offer applies to the purchase and installation of a plumbing repipe. Even though you may realize it, keeping your water pipes in excellent shape is absolutely critical. From showering, to drinking water, to washing dishes, your water pipes are the most crucial plumbing system to maintain. Replacing defective pipes in a 1,600 s.f., 2 bath home costs between $10,000 to $15,000 dollars. This requires cutting open ceilings and floors, so you certainly don’t want to jump the gun. Here’s a step-by-step guide to installing new water pipes. For raised wood floors, bore a hole through the stud and sill plate. Put the bit near the stud and drill slowly, give it allowance to gather speed. Bore a hole through the sill plate and subfloor for water line. When making a hole through the stud, make sure the holes are on the same level. As soon as you drill the holes, begin to install the water lines. Most times, the lines run from the floor and at times, the lines are installed across the wall studs. This will prevent nails from penetrating the pipe when hanging the wall board. Install the other end to the place where the water will enter the house. Make sure excess pipes are left on the two ends of the installation. Fasten the line to the joists with the use of clamps. Try as much as possible to separate the hot and cold lines to reduce heat transfer. Let there be little space in case of expansion and contractions and remember to label the lines. By doing a rough stub, it means fixing a kind of copper fitting that conforms to the PEX. Towards the end is a cap which enables you charge the system with air or water to check for leaks. Once the walls are set up, the cap can be removed and the finish valves can be fixed. The most important area of the project work is pipe expansion. If this is not done properly, it could cause the system to leak and pose other problems. We have two types of expansion tools, but one uses battery and makes the job easier. 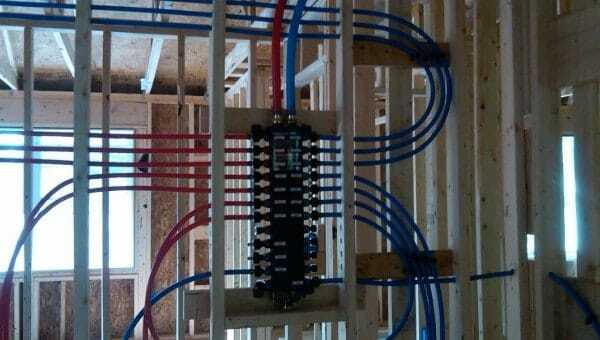 To make your expansion very good, begin by cutting the PEX and be sure it is straight. Put a ring on the pipe, expand it and then insert the fitting into the pipe. There will always be a small shoulder on the fittings for you to slide the PEX on. This phase is very important for leak free joints. Because you cannot solder around the PEX piping, make use of the PEX 90 fittings that sweats into place. As soon as it cools down from soldering, it can be connected to the PEX. It is very important to take a mixing valve away before soldering it. Make use of quality soldering methods when preparing the fittings and valve. Once everything is set, arrange the fittings in a way that they will face down when you put the valve in place. Solder them into place and make sure the valve gets cold before you position it. The water lines can be brought up and fixed to the manifold. Place the manifold above eye level and fix the top mounting bracket to the studs. Fasten the manifold to the bracket with the screws provided by the manufacturer. Attach the bracket to the manifold and make sure it is plumb before attaching the bracket to the studs. You might have to bring down the manifold when drilling. Fix the PEX ball valves to the manifold since all the holes have been drilled and the manifold is standing. Climb up to find the port and put it in place by screwing and take one of the lines up to the valve. This allows each fixture to have its own shut off valve. Once the ball valves are in position, pull up the PEX lines from the crawl space and be careful not to damage them.